There is no doubt that this low priced kit is perfect for a variety of telescope users, but is it a good long-term deal? 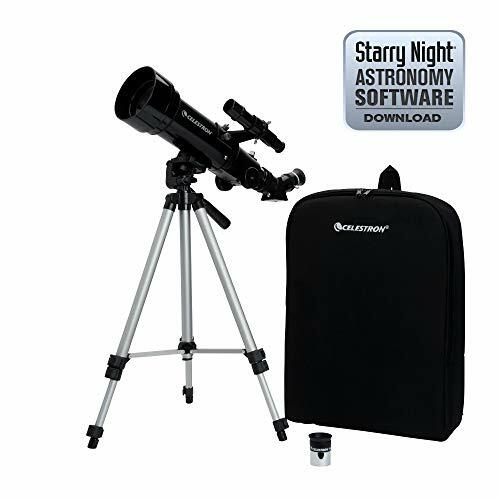 It comes with a lot of accessories and extras that telescopes in a similar price range don’t have, and it gives dependable performance that won’t disappoint most level of users. Setting it up is pretty easy, and with the right setup it can be just as usual away from the home than it is in your back yard. With Celestron being one of the main sources for great telescopes in the industry, this small 70mm proves that it has a lot more to offer than just extras. There are two available models, and they both come with the backpack. Users can opt for the low powered 50mm model, and power users can stick to the 70mm model, which comes as the most recommended version. The 50mm version will easily become underpowered within the first year of use, and is incapable of keeping up with the skills of the user. Overall both models exhibit similar functionality and an overall great mechanical structure, staying away from putting any of their buttons in awkward places. Everything is within reach and the entire process of using it feels natural. From the ground up this is a beginner telescope with some intermediate prowess, but one that will only suffice for a few amount of intermediate users. Expert users won’t even has a use for this as a backup, but that is no reason for beginner levels to not consider this telescope. This is the perfect beginning telescope and contains everything a user needs to get started. It may be a little underpowered for intermediate users, but that’s not the target audience for the scope. In a beginners hands this will last them a good chunk into their intermediate use before they outgrow it and need an upgrade. It’s a pretty solid product, and that includes the backpack, telescope and the tripod. The tripod is made of preassembled aluminum with some really great stability improvements built into the heels. It’s not a rock solid tripod in terms of taking a hit, but it is good. The telescope is pretty average for withstanding damage, but if all of these pieces are properly used with the backpack it doesn’t even matter. Many sets lack the backpack option which would protect them from damage in the first place. So to be fair, if using this properly with the backpack then this is probably the most durable product on the market. The obvious pro is going to be that this is one of few quality units that come with a backpack. Having two versions to choose from is great, and offers some variety upfront. There is a wealth of great software to cycle through that is a great introduction to stargazing for beginners. Using the tripod is fun and offers nice stabilization, even if it isn’t made of top tier materials. Images are crisp and clear thanks to the coated glass optical, and movement is easy with the smooth functioning altazimuth mount. Everything that you need to take with you can fit comfortably in the provided backpack. This isn’t as powerful as other scopes, so it mainly for beginners. The other option for the 50mm is weak, even for a beginner and will probably only be useful for about a year, even for casual use. The mount is great but the tripod is average. A better tripod would have made a big difference when taking the unit out on the road, and would be especially useful on grassy areas. And even with the 70mm being the standard, users that quickly move up to intermediate status will find that it’s also lacking in power. This is very much a beginner scope, and the included bundled software doesn’t try to hide it. Expect the included backpack to be just as strong as a school backpack, and to last longer than the scope itself. It is very well built and is not prone to easy rips or tears associated with cheaply made backpacks. Software bundled with the product includes “TheSKyX- First Light Edition”, a nice starter astronomy software title that holds some pretty good value by itself. There is a 10,000 object database with 75 high quality images and printable sky maps for beginners to go through. A finder and focuser are included, but is made of plastic, so getting another one to replace the one included is recommended. If purchasing the 50mm set then it really isn’t that much of a bargain. You’ll be purchasing underpowered tech that will most likely not be sufficient enough to do great stargazing. If participating in a stargazing group, this would be the weakest of the bunch by far. The real value is going to be with the more appropriate 70mm model. This variant of the product is great and should provide more than is necessary in order to get started with astronomy. The power is just slightly above the average, and if you factor in the mount, tripod, and backpack then it is a great value that is a steal at the current price. But once again, remember that is for the 70mm version and not the 50mm version. There isn’t a lot of lasting appeal in this product for buyers that are planning to do some serious looking at the stars over the years. It’s just too underpowered to hold up to a user that is progressing naturally when watching the stars, and sooner rather than later an upgrade will be necessary. But if the user in particular is simply a hobbyist that does casual stargazing, then this will work out great since they don’t need to have the latest and greatest. The lasting appeal in this telescope will have the best chance of reaching its peak with the hobbyist, with beginners coming in at a close second. Anything higher than those levels will probably end up requiring an upgrade after the first year. The best product to compare it to is surprisingly from the same company, the Celestron 21037 PowerSeeker 70EQ Telescope which retails at around the same price. It has multiple options available that will appeal to power users, with a high customization that will work across several user levels. It doesn’t come with a backpack like the 21035, but the materials used are a lot more high quality, right down to the mount. If looking for long-term appeal when buying a telescope then the Celestron 21037 is a great option, but if you want the better deal, then stick with the Celestron 21035. With the current price it can still be considered a tossup between the two, so either way you decide to go you’ll get a good deal. Budget telescopes usually get a bad rap due to bad materials and not enough extras included. But this product does a wonderful job of not only breaking that mold, but offering a new perspective to the 70mm budget range. It is a great quality telescope that will work great for casuals, beginners and hobbyists that don’t want to spend a ton of money.